Tourist-Channel Slovakia - Čajkov Tourist-Channel Slovakia: New homepage! 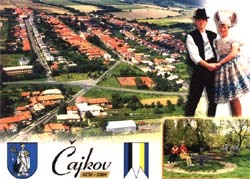 The village of Čajkov is situated on the southern edge of the mountain range known as Štiavnické vrchy. This smaller village with only 1055 inhabitants is located in the District of Levice. The earliest written reference of Čajkov dates from 1276. This lovely Slovak village has always been known for the production of high quality wines and keeping old folklore traditions and local culture alive. 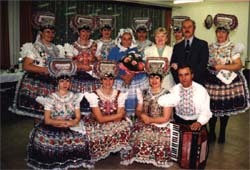 Several dancing and singing groups have been established in the village over the past decades - many of them perform on regular basis at the local festivals and fetes. The members of these groups wear traditional costumes which are very colorful and unique. The village is surrounded by woods - good opportunity for those who enjoy to get out and do a bit of walking and exploring. There is a well known local footpath called "Čajkovské bralie" which goes through some of the most interesting places in the area.